Although this classic style dog-trot house is newly constructed from hand hewn logs and stone, it feels truly authentic as if it has been here for a 100 years. Downstairs is the ideal lodging for two couples with two suites and a fabulous shared screened in porch perfect for unwinding. The James Washington Winters Suite, named after a Captain in the Texas Rangers who is the grandfather of your host and survivor of the Battle of San Jacinto, and The Andrew Jackson Sewell Suite, named after the lone survivor of the Alamo who is also a Ranger, are both perfectly appointed with elegant Texas décor. Both are private suites with Queen beds, baths with showers and kitchenettes. Outside flanked on both sides are two relaxing patios with plenty of comfortable seating perfect for enjoying sunrises and sunsets. We just spent two nights at The Stage Stop in Mountain Home. The setting was beautiful with deer, gnarled oaks, and Hill Country landscaping. The dog-trot cabin with two suites was impeccably appointed and spotless, with every amenity needed by us and our friends. 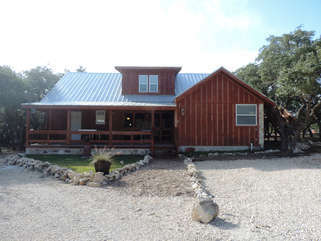 The location was perfect for visiting Boerne, Kerrville, Fredericksburg, and other unique Hill Country sites. But the thing that puts The Stage Stop above every other property we’ve stayed in is the simply spectacular hospitality of the owners and your hosts, Wayne and Betty Musgrove. They live on site, and welcomed us in person when we arrived, shared their home and vast knowledge of Texas history with us during our stay, and then prayed for us as we left. You can find many places in the Hill Country that have great views, beautiful facilities, and a perfect location. But the only place you can find Wayne and Betty is at The Stage Stop. They blessed us in many ways during our brief stay, and we can’t wait to go back! !